Bloomsbury USA Childrens, 9781681191416, 128pp. In this first book of a new chapter book series by E. D. Baker, one girl has the adventure of her young life! Eight-year-old Maggie has a keen eye for noticing things in the Enchanted Forest that no one else does -- like unicorns, griffins, and tiny flying horses with wings. 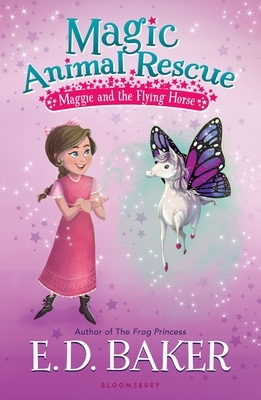 One day while Maggie is herding sheep with her pesky stepbrother, she stumbles upon an injured flying horse. The only way to help the horse is to take it to a kindly stableman named Bob, who cares for many different magical animals! But in order to do so, Maggie must set out on her own and journey through the Enchanted Forest, which is full of dangerous trolls and goblins who get in her way. Will Maggie reach Bob in time to save her new friend? This new, black-and-white illustrated series is perfect for fans of Princess Ponies, Magic Horses, and Critter Club. E. D. Baker is the author of the Tales of the Frog Princess series, The Wide-Awake Princess series, The Fairy-Tale Matchmaker series, and many other delightful books for young readers, including Fairy Wings, Fairy Lies, and A Question of Magic. The Frog Princess was the inspiration for Disney's hit movie The Princess and the Frog. She lives with her family and their many animals in Maryland.